If you'll be hanging Christmas stockings out for Santa Claus to fill on Christmas Eve, you'll need a good hanger to make sure they stay in place until Old St. Nick arrives. These stocking holders are both fun and functional and will add some Christmas cheer to your home. Choose traditional holders for the fireplace mantel or find "go anywhere" holders that can be used in homes without a chimney. 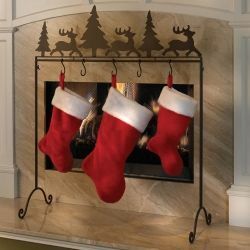 This page includes popular stocking holders from stores around the web, so you don't have to visit multiple stores to find something you like. These metal frames hold a 3-inch photo. and you can easily change the picture each year to make sure you've got the latest picture to show Santa Claus. Elf on the Shelf fans will love this holder! These Santa holders are great for any household, but kids will especially love seeing their favorite holiday icon holding on to their stockings and waiting for the real Santa Claus to arrive. If you're looking for a classy or elegant fixture to hold your stockings, this brass NOEL holder is a great option. This 4-Piece brass stocking holder set by GKI/Bethlehem Lighting spells out the word N-O-E-L. Each holder is 8.5" high and the base has felt on the bottom. Can hold stockings up to 2 bs. Also available in holders that spell P-E-A-C-E and J-O-Y. When I was little, Santa always left a mandarin orange in the toe of my Christmas stocking. I always figured it was just an easy way to fill the toe. It wasn't until I was an adult that I learned this practice is actually a tradition that harks back to the days of Saint Nicholas, the real man whose spirit of giving later gave rise to the tradition of leaving Christmas stockings out for Santa to fill. Saint Nicholas was a bishop who lived during the third century and was well known for his acts of kindness. He was particularly known for helping children. One of the most common stories about Saint Nicholas is the tale of how he saved three young sisters from being sold into slavery. Their father was poor and couldn't afford the dowry to marry them, so one night St. Nicholas crept by their house and threw in three bags of gold. Later legends claim that he threw the bags down the chimney and they landed in stockings hung by the fire to dry. This legend gave rise to our tradition of hanging Christmas stockings by the fireplace. The gold Saint Nicholas used to save the girls from slavery was often represented as gold balls, and later these became symbolized by oranges or even apples. So the tradition of stuffing the toe of Christmas stockings with an orange is a reminder of Nicholas' gift. An Orange in the Toe of Your Stocking? - Is this a tradition in your family? Leaving an orange in the toe of your Christmas stocking is a tradition that harks back to the legends of Saint Nicholas. Other traditions such as hanging stockings by the fireplace are also part of Santa history that has been passed down through the years. Does Santa leave an orange in your stocking? Who knows more about Christmas stockings than Santa's reindeer? Use this reindeer holder for your stockings and Santa Claus is sure to fill it with something you'll love. Creative Gifts Reindeer Stocking Holder, Nickel Plated. From Amazon: This nickel plated metal stocking holder can be personalized to let Santa know who has been good. The stocking holder is made of nickel plated metal and will not tarnish. 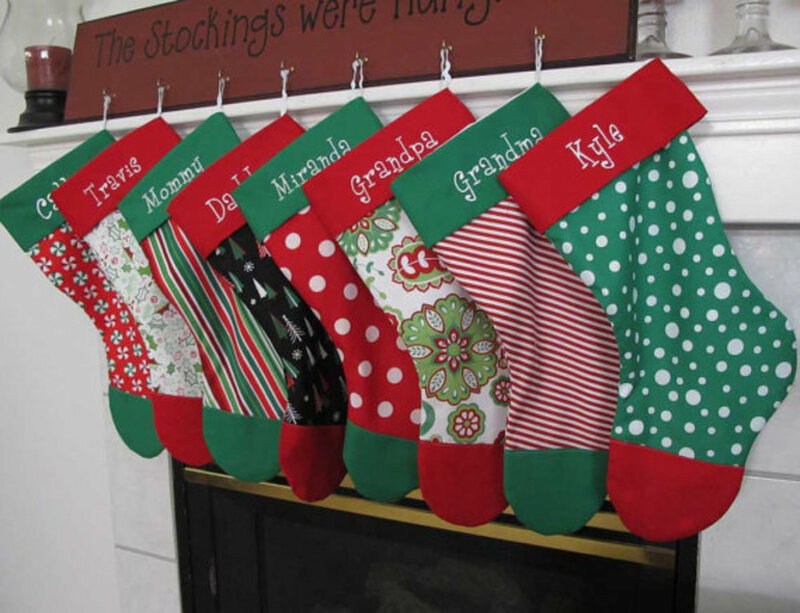 Personalize this stocking holder with the recipient's first name. If the reindeer holder above doesn't match your tastes or decor, try some of these instead. Many people enjoy decorating with nutcrackers during the holidays, and these stocking holders will make a great accessory to go with any decor. What's Your Favorite Stocking Stuffer to Give or Receive?